Michael Dunlop at Ballaugh Bridge on the Bennetts Suzuki during TT practice on Tuesday evening. Michael Dunlop made a promising start to the 2017 Isle of Man TT as the Ulster rider completed his first laps on his new Bennetts Suzuki. Dunlop, who holds the outright lap record for the Mountain Course at 133.962mph, lapped at 125.680mph from a standing start on his very first TT lap on the new GSX-R1000. Michael Dunlop was second fastest in Superbike practice on Tuesday at the Isle of Man TT after lapping at 125.680mph from a standing start. The 28-year-old was second fastest overall as practice got underway on Tuesday evening behind fierce rival Ian Hutchinson, who clocked 125.839mph on his Dunlop-shod Tyco BMW. Dunlop said: “It's a good start. We're the only team here with a brand new bike and we've started strongly. The 28-year-old was riding the Suzuki in its latest spec on Tuesday for the first time and also lapped at 125mph on his second lap after making some tweaks in the pits. Team manager Steve Hicken said the 13-time TT winner’s performance was ‘more than we could have asked for’. “It's been a very good start. 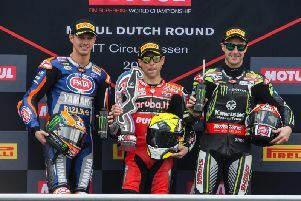 Michael hadn't ridden the bike in that spec before, so to go out and be competitive right away is already more than we could have asked for tonight,” he said.